As Hurricane Harvey roared toward the Texas coast in late August, weather models showed something that forecasters had never seen before: predictions of four feet of rainfall in the Houston area over five days — a year’s worth of rain in less than a week. “I’ve been doing this stuff for almost 50 years,” says Bill Read, a former director of the National Hurricane Center who lives in Houston. “The rainfall amounts … I didn’t believe ‘em. 50-inch-plus rains — I’ve never seen a model forecast like that anywhere close to accurate. That unbelievable-but-accurate rain forecast is just one example of the great leap forward in storm forecasting made possible by major improvements in instruments, satellite data, and computer models. These advancements are happening exactly when we need them to — as a warmer, wetter atmosphere produces more supercharged storms, intense droughts, massive wildfires, and widespread flooding, threatening lives and property. And yet the Trump administration’s climate denial and proposed cuts threaten these advances, spreading turmoil in the very agencies that can predict disasters better than ever. The president’s budget proposal would slash the National Oceanic and Atmospheric Administration’s budget by 16 percent, including 6 percent from the National Weather Service. Besides hampering climate research, the cuts would jeopardize satellite programs and other forecasting tools — as well as threaten the jobs of forecasters themselves. And they may undermine bipartisan legislation Trump himself signed earlier this year that mandates key steps to improve the nation’s ability to predict disasters before they happen. It’s hard to overstate how backward that seems after the hurricane season we’ve just witnessed, as well as the deadly wildfires in California, the climate-charged droughts and deluges and, well, you name it. Just when we need forecasting to be better than ever — and need our forecasters to be able to go even further, using those predictions in ways that protect people’s lives and livelihoods — the Trump administration wants to cut back? 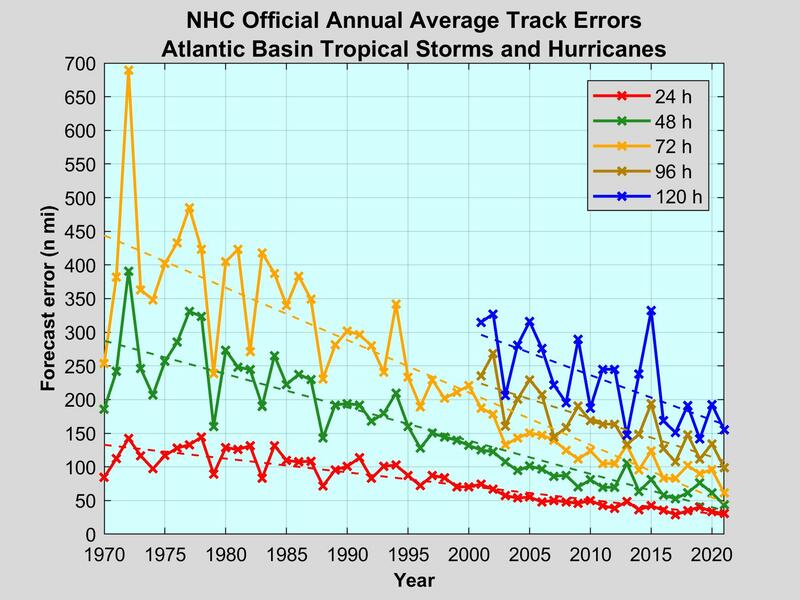 Here’s how far we’ve come in forecasting: Three-day hurricane forecasts are now nearly as accurate as one-day forecasts were when Katrina struck 12 years ago. Even routine, “will it rain this weekend?” forecasts are better today than you probably realize. A 2015 paper in the journal Nature called the advancements a “quiet revolution,” both because they’ve gone relatively unnoticed by the general public, and because it’s been cheap. The National Weather Service, an agency of the U.S. government, costs taxpayers about $3 per person each year. Still, knowing what the weather is going to do tomorrow and understanding how best to warn the public about potential risks are two different things. The first is all about physics; the other is about psychology, human behavior, social interaction, the built environment, and much more. You can guess which is easier. Forecasts for Hurricane Harvey’s rainfall totals might have been stunningly accurate, but the floodwaters still surprised thousands of people. Days after Harvey’s rains ended, first responders in towns throughout southeast Texas were still rescuing families stranded by rising waters that flowed downstream toward the Gulf. In the interest of saving lives, forecasters have started moving from simply predicting the weather to attempting to predict the consequences. Call it impact forecasting, an attempt to say what will happen after the rain hits the ground. Scientists hope to answer questions like: Where will water accumulate? Where will floodwaters head? How will it affect people? The next step is using those “impact forecasts” to get people to safety. Researchers are working to build customized, real-time personal prediction tools that could tell people if their house is likely to flood, or how long they might go without power. There’s also a drive to create easier to understand warning systems, making better use of the latest communication tools and social media. Besides getting people out of harm’s way, better warning systems could help by letting nonprofits seek donations in advance of a devastating storm, for instance, so they could provide relief more quickly. And they could help public officials do a better job of prepping for the worst. “This was a good step forward,” says Kim Klockow, a meteorologist and behavioral scientist at the University of Oklahoma who supports the effort to develop impact forecasting. “It admitted something very important,” Klockow says — namely, that the system we have for warning people isn’t good enough. In fact, experts say the best early-warning systems are ones that start years before the wind picks up and raindrops begin to fall, alerting people who live in vulnerable areas who might be prone to more threats in a climate-charged world. In part, that’s a consequence of insufficient flood-zone maps. Even though rainstorms are getting more intense as the climate warms, FEMA sticks to historical flood data to determine which neighborhoods are required to purchase flood insurance — a policy that’s already leading to skyrocketing losses from floods. A recent study showed that 75 percent of the flood losses in Houston between 1999 and 2009 fell outside designated 100-year flood zones. If residents don’t know their home is at risk of flooding, they’re less likely to consider that it might, even when a major storm is forecast. So it’s no surprise that, after floods, people report being caught by surprise. How to keep them from getting surprised? Talk plainly. There’s evidence that giving people unambiguous information can help move them to action. Recent research has shown that people often need to see the storm with their own eyes before they take cover. They need to see neighbors boarding up their houses before they do the same. Before Hurricane Katrina hit the New Orleans area in 2005, the National Weather Service issued a blunt statement that promised “certain death” should anyone be trapped outside unprotected. A post-storm analysis credited that warning with spurring an evacuation rate of more than 90 percent. Read says that’s why the Weather Service is shifting its focus toward making impending storms feel as real as possible to those in its path. Forecasters need to “personalize the threat,” he says. Klockow says that she’d like to see flood warnings take a personal approach, too. During a storm, an overlay in Google Street View could show you how high the water is rising in your neighborhood and re-route you away from flooded roads to get you home safely. The tools to make that happen already exist. Several companies and local governments have already developed mapping tools that to warn of impending floods. North Carolina’s Flood Inundation Mapping and Alert Network relies on 500 measurement stations across the state that transmit their readings back to a central database. When conditions are ripe for flooding, the system’s software estimates possible consequences and alerts emergency managers. This budding technology, integrated with databases of rescue supplies, could help FEMA figure out where to put aid and supplies before they’re needed. Other organizations are working on an initiative called “forecast-based financing.” The idea is to allocate money for clearing out storm drains, as well as distributing first aid and water filtration systems, in the days ahead of a storm. Already tested in Uganda, Peru, Bangladesh and other countries, this innovation is now in the process of being scaled up worldwide. It could help organizations like the American Red Cross craft appeals for donations in advance, instead of relying on scenes of devastation after disaster strikes. All of these efforts and ideas show a lot of promise. Yet even as forecasters have come to understand the importance of developing better advance-warning techniques, their ability to undertake those efforts is being undercut by a White House hostile to funding science. Earlier this year, along with recommending that Congress gut funding for NOAA, President Trump proposed an 11 percent cut from the National Science Foundation’s budget, slashing funds from the institution behind much of the country’s basic scientific research. If Congress agrees, it would be the first budget cut in the foundation’s 67-year history. At the National Weather Service, the Washington Post recently reported that the agencycouldn’t fill 216 vacant positions as a result of a Trump-imposed hiring freeze. As a result, meteorologists were working double shifts when hurricane after hurricane hit last month and covering for each other from afar. A forecast center in Maryland, for example, provided days of backup to the National Hurricane Center as hurricanes spun toward shore. National Weather Service meteorologists at the San Juan, Puerto Rico, office complained of “extreme fatigue.” Colleagues in Texas stepped in to give them breaks. The threat of budget cuts is already crimping federally funded disaster research. A few days after Harvey struck Texas, the Colorado-based National Center for Atmospheric Research — one of the country’s top meteorological research institutions — cut entire sections of its staff focused on the human dimensions of disasters, including impact forecasting. In an all-staff meeting on Aug. 30, the center’s director explained that the anticipation of tighter budgets forced the decision. But researchers at the center, called NCAR, say the layoffs will hurt efforts to make forecasts more human-focused and effective. Read, the former hurricane center chief, says increases in supercomputing power shouldn’t come at the expense of developing forecasts that work better for people. “You can’t drop one for the other,” he says. The cuts to the National Center for Atmospheric Research will result in the loss of 18 jobs. That may not sound like a lot, but consider that these were some of the only scientists in the United States working to prepare our country’s system for predicting disasters in an era of rapid change. In that context, the recent revolution in meteorology and pitfalls in preparedness become a powerful metaphor: We know that if we stick to our current course, the future will be bleak. Acting on the forecast of a warmer planet in a way that helps us to usher in a safer and more prosperous future is completely possible, and the stakes keep getting higher. One-third of the U.S. economy, some $3 trillion per year, is subject to fluctuations in the weather, and millions of people endure weather disasters every year — a number that keeps going up as climate change boosts the frequency and intensity of storms. Despite excellent weather forecasts, hundreds of people have lost their lives, and billions of dollars in economic value have been lost during this year’s record-breaking hurricane season. In some especially hard-hit places, like Barbuda, Dominica, Puerto Rico, and the U.S. Virgin Islands, recovery will take years, or longer. But it doesn’t have to be this way. Get people out of a hurricane’s path, put aid workers and supplies in the right place, and a raging storm might not lead to a catastrophe. We are living in a golden age for meteorology, but we haven’t yet mastered what really matters: knowing in advance exactly how specific extreme weather events are likely to affect our lives. Getting that right could usher in a new era of disaster prevention, rather than the current model of disaster response.